Ever since I had the privilege last January of being signed to Roto Grip staff, I have felt that our lineup was in need of really good pearlized options to compliment the 51ML™ pearl reactive SHATTER. The microbite technology in the pearl cover of the DEFIANT EDGE has most often created a hook/stop reaction for me that I have seldom found helpful. 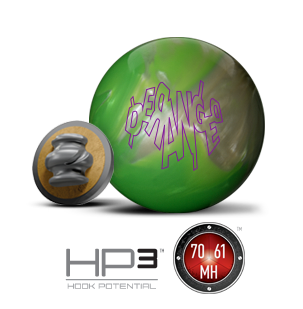 Consequently, the DERANGED is a ball I've been waiting for for a while. The DERANGED is built around the same guts as the very popular DISTURBED solid - its companion in the HP-3 sector of the Roto Grip lineup. As such it's natural inclination is to produce the same solid rolling, arcing ball motion as the DISTURBED but with more respect for oil and more pop off the dry like you'd expect from a pearl coverstock. The DERANGED's 61MH™ pearl cover does exactly what you'd expect and hope for in that regard. What I was most looking for from a new pearl in the Roto Grip lineup was a smooth and clean symmetrical pearl that would get down the lane with effortless length and produce a strong hockey stick move toward the pocket at the end of a pattern. I needed something with a little more length than I get from my WRECKER (52ML™ hybrid) which would allow me to really open up the lane when I need to and which would still give me the extra kick down lane that my stroker game particularly needs when I have to play deep angles in the middle of the lane. I knew instinctively that the DERANGED's core wouldn't allow it to naturally do everything that I was looking for so I asked some drilling advice from the genius minds at Storm/Roto's R and D Department and, thanks to their help, we got pretty darn close to what I needed. My DERANGED is drilled with the pin about an inch and a half above my ring finger with the CG about two inches right of my center grip line, creating almost the 60 degree drilling angle that I use a lot on many toys in my arsenal. The pin here ends up about 5 inches from my PAP. We drilled as substantial a weight hole as we could between P2 and P3 to try to adjust the differential to get me as much of the ball reaction I was looking for as we could. Ideally, I would have benefitted from having a Pin to CG distance closer to 4 or 4.5 instead of 3.5 but we got pretty close to what I was hoping for. The DERANGED's first outing for me was at the tail end of an eight game qualifying block in a Land of Lincoln doubles tournament on a hooking house shot when it got to be time to put away the new RUMBLE that I had started the day with. 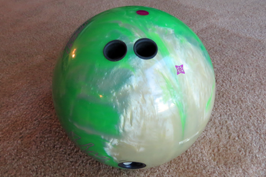 From a deep inside line close to 20 board the DERANGED gave me the good length I was hoping for without having to throw the ball too hard and it gave me a really nice strong move back to the pocket and through the pins down lane. The proof in the pudding for me in situations like that is when I have something in my hand that allows me to generate good carry from a deep angle not only on hits that are flush but also half-pocket. The DERANGED did not disappoint at all in that regard. It even sent a few messengers at the ten pin for me, which is always a bonus in my typically down-and-in almost over-50 world! I do need to say that the MH (medium/heavy) grime rating that Roto Grip gives the DERANGED might be a little bit of an overstatement in my experience so far. I have found it a little more respectful of oil than an MH rating would suggest. My early read is that an ML (medium/light) volume environment would be the more effective performance environment for the DERANGED. I'm sure I'll learn more about the ball with more opportunity for use as time goes on...and I'll update here as necessary, but for now I'd say if you're looking for a pearl to use on heavy oil volume patterns I'd take a close look at the TOTALLY DEFIANT. You can't go wrong with a DERANGED in its niche, though - which my early intuition tells me would also include a variety of flatter sport patterns. Looking forward to seeing how that hunch plays out over time!